In the ancient olympic games Greek athletes had an aid the modern broad jumper does not have. In each of his hands the Olympic competitor carried halteres, stone or metal weights fashioned in various shapes. With skill and practice, the Greek could add many feet to the length of his jump by using the halteres, which weighed from two to ten pounds each. By their very force the halteres pulled the jumper forward; depending on the skill with which he handled the weights, he could arch his body forward in a graceful propulsion. Halteres which can be seen in many museums today, were carved from stone or molded from bronze. Some had a hole by which the jumpers could get a good grip; others were cut more like dumbbells, with a small neck for grasping, and a larger scimitar-like curved section for added weight. The shape, size, and weight were a matter of individual preference; there were no rules laid down by officials. Absence of rules about halteres may seem strange perhaps it is. 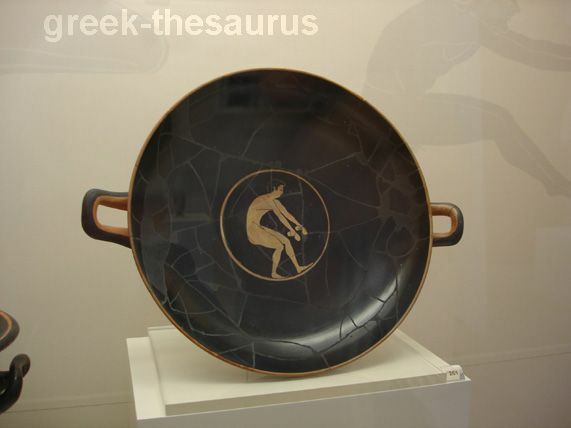 But when reading the literature of the and looking at hundreds of vase paintings illustrative of th broad jump, one comes to the conclusion that the design of halteres was a very personal thing. Without doubt the use of them was an individual skill, developed on general principles to permit each athlete to attain his own greatest possible distance. One man might employ a five-pound weight to jump farther than another who used a ten-pound weight. Everything depended on the style and manner in which the broad jumper swung the weight and controlled his body during the jump. Trainers were broad jumpers who could catch the personal rhythm and style of the athlete; and like all good trainers these could help an athlete to recognize his own style and perfect his performance. Training consisted of four parts: The run, hop, or skip made before the jump; the take-off from the jumping line; the forward arch of the jump itself; and the firm, flat-footed landing. The Greek jumper had to land and stand erect; if he fell, he was disqualified. Since so much depended on the grace of performance, the broad jump performed by the ancient Greeks was a balletic leap of great beauty. In the running broad jump the athlete could use a distance of about five yards for his run. Halteres in hand, and head turned back to get the feel of the swing, he raced forward to the balbis, the starting line, to make his leap.